The conventional wisdom about Tuesday’s debate has taken shape. 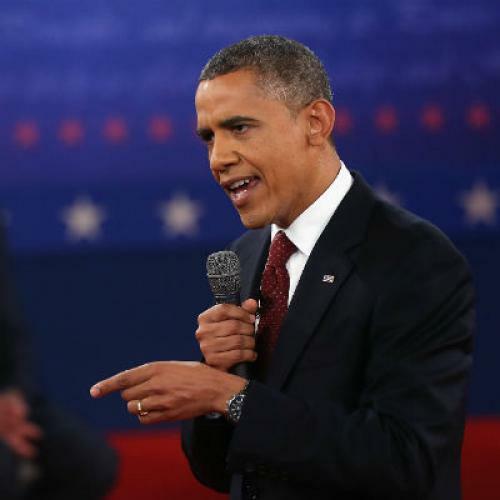 President Obama performed better than Mitt Romney, maybe even a lot better. But he failed to describe a governing vision for the future. This has been a persistent weakness of his campaign, the argument goes, and it’s becoming a huge liability. It makes complete sense. Just imagine what would have happened on Tuesday if Obama had described a series of specific economic proposals—if, say, he had called for tax incentives to bolster manufacturing, investments in community colleges that train people for local jobs, more development of green energy, and a deficit reduction package that blended spending cuts with higher taxes for the wealthy. I counted five distinct ideas in that soliloquy—each very brief, for sure, but each referring back to a very specific proposal that Obama has introduced sometime in the past year. Some of them were part of the American Jobs Act, which independent, respected economists said would create a few hundred thousand and maybe more than a million new jobs over the course of a year. Some of them were part of Obama’s latest budget and deficit reduction proposals, which projections show would stop the debt increasing relative to the economy about a year from now and then cause it to decline, slightly, for the next decade. But the idea that Obama hasn’t laid out a specific agenda for the future is just nonsense. And it’s particularly galling to hear it from conservatives, who have been pushing this argument for a while, when the charge happens to apply to their preferred choice for president. Yes, Romney talks constantly about his “five-point plan.” But it’s not really a plan. It’s a set of bullet points, largely bereft of dollar figures and other details. And while the Romney campaign has been touting studies that supposedly show his jobs agenda would create 12 million new jobs, that claim, too, turns out to be false—as the Washington Post’s Glenn Kessler pointed out this week. Romney has been slightly—and I do mean “slightly”—more specific when it comes to his plans for reducing federal spending. He’s said he wants to cap it at 20 percent of gross domestic product, setting aside 4 percent for defense. That would be a devastating cut of historic proportions. Romney hasn’t given too many details about exactly which programs he’d slash, perhaps because voters might not love the idea of major cuts to food safety inspections or the FBI. But Romney has mentioned a few specific cuts—most prominent among them, a plan to dramatically reduce Medicaid spending. That plan would likely force many millions (like up to 27) to lose health insurance and/or leave elderly people with no way to pay nursing home bills. On the campaign trail, Obama has spent a lot more time talking about these ideas, and why they are so awful, than he has about his own proposals, and why they are so great. But what's wrong with that? Getting people back to work more quickly and addressing our long-term fiscal problems are very important. Protecting Medicare, Medicaid, and essential government programs from the kind of assault Romney has described—an assault that would, in one way or another, affect just about every single American—is even more important. Talking about the future doesn’t have to mean talking about what you’ll do. It can also mean talking about what you won’t. One final note: To the extent Obama hasn't laid out a "new" vision for the future, it's because his new vision is the same as his old vision. As he's said over and over again, including on Tuesday night, he believes government has a vital role to play in domestic policy—as a watchdog, guardian of economic security, and instigator of growth. The focus of his first term was enacting policies that would allow government to do this. Think financial regulation, universal health care, and the Recovery Act. His second term, necessarily and appropriately, would focus on pursing those same goals—whether by seeing the Affordable Care Act through to implementation or further boosting the economy through the American Jobs Act. In the Washington Post today, Michael Gerson dismisses these things as the "Marginally Greater Society." But making health care available all Americans, creating the foundation for a green energy future, and reorienting the tax code in a more progressive direction represent some pretty bold efforts to change America. Not everybody approves of that agenda. Fine. Let them criticize it on the merits, instead of pretending that it doesn't exist.